Mt. Rainier National Park - Washington. Mount Rainier National Park is a United States National Park located in southeast Pierce County and northeast Lewis County in Washington state.It was established on March 2, 1899 as the fifth national park in the United States. 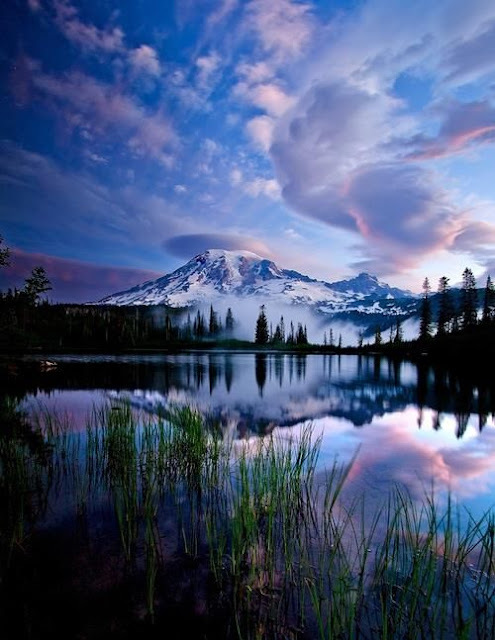 The park encompasses 236,381 acres including all of Mount Rainier, a 14,410-foot stratovolcano. The mountain rises abruptly from the surrounding land with elevations in the park ranging from 1,600 feet to over 14,000 feet. The highest point in the Cascade Range, around it are valleys, waterfalls, sub alpine wildflower meadows, old growth forest and more than 25 glaciers. The volcano is often shrouded in clouds that dump enormous amounts of rain and snow on the peak every year and hide it from the crowds that head to the park on weekends.